Painful joints, creaky bones and difficult mobility are all symptoms of arthritis. This is how one might describe the life of their grandparents, but rarely use it to describe their pups. The truth of the matter is that just like us, as our dog’s age, they too suffer from the same debilitating condition. Canine arthritis begins to affect most of our four-legged companions after the age of 7, for some breeds it could be sooner and others not until much later. The most common form of canine arthritis is called canine osteoarthritis, which is said to affect at least 16-20 million dogs in the United States alone. Many times a veterinarian will prescribe NSAIDS (Non-Steroidal Anti-Inflammatory Drugs) to help relieve the pain, but this does not treat the cause and it can lead to more complications such as kidney damage, ulcers and liver failure. So what is a concerned and loving pet parent to do? Enter T-Cyte Therapeutics, Inc. Founded and led by C.E.O. Dr. Terry Beardsley. T-Cyte offers a treatment called LTCI (Lymphocyte T-cell Immunomodulator), which just became the first USDA approved treatment option for canine osteoarthritis. The best part about this treatment? It’s 100% natural and safe. I recently had the pleasure of interviewing Dr. Terry Beardsley and inquired more about the benefits of this groundbreaking new treatment for our fur-babies. DA: Hello Dr. Terry Beardsley, I appreciate you taking the time to have this interview with the Dog Advertiser today. Please tell us a bit more about your background and the motivation behind your decision to start T-Cyte Therapeutics, Inc.
TB: I received my doctorate at Baylor College of Medicine Graduate School where I studied congenital immune deficiency and that was the subject of my doctoral thesis, particularly focusing on bone marrow transplantation. Then, I moved to the University of California, Los Angeles to do a post-doctoral fellowship in Nuclear Medicine and Radiation Biology, and that’s where I discovered this protein. We were actually working on another project trying to figure out how retroviruses, like Feline Leukemia Virus, induced leukemia and in the process we found this protein. I later I moved down to the University of California San Diego and started focusing on this protein, what it was and how it functioned, and that led to a couple of seminal publications in the 80s. Those are on our website, in downloadable PDF, and it really describes the protein and its effect on the immune system. After 3 years at UCSD, I left academia and went to work for a big pharmaceutical company. This work sat on the shelf for a while, and then I started the forerunner of T-Cyte Therapeutics in the 90s, where our parent company S-Cell Biosciences, Inc. was focusing on the ability of this protein to affect immune deficiency disease. We used feline leukemia virus and feline immune deficiency virus in cats as a model for human AIDS. That culminated in the approval that we received for treating those two diseases in cats. So, that’s been our focus for most of T-Cyte Therapeutic’s history. DA: Currently, your flagship product is LTCI (Lymphocyte T-cell Immunomodulator) and is used to treat Feline Leukemia Virus (FeLV) and Feline Immunodeficiency Virus (FIV). Congratulations, as it has recently been approved by the USDA to treat canine osteoarthritis. Can you explain to our audience what LTCI is and how it works to combat canine osteoarthritis? TB: LTCI is the only biologic treatment aid for canine osteoarthritis. It works by increasing the number and function of precursors of certain regulatory cells, thereby dampening the immune-mediated process associated with osteoarthritis. Most current treatments on the market are designed to only treat the symptoms of the disease. LTCI, however, affects the underlying immune-mediated diseases process of osteoarthritis, meaning that it’s not only addressing the symptoms, but the disease itself. DA: I know this treatment will be of particular interest to many pet parents. As arthritis affects a vast majority of senior dogs, and the current pharmaceutical options such as NSAIDS (Non-Steroidal Anti-Inflammatory Drugs) potentially cause more harm than good. Other than arthritis, heart disease is quite common in senior dogs and if your dog has both of these conditions, NSAIDS tend to pose more of a risk when a heart issue is present. With that said, is LTCI completely natural and safe? TB: LTCI is completely natural and safe. It is not synthetically manufactured, and it is a naturally occurring biologic, rather than a drug. LTCI has passed a formal scientific, clinical safety study in which no significant adverse events were reported, and it has been approved by the USDA for use in treating all dogs over the age of one year. Unlike NSAIDs, there are no known contraindications for the use of LTCI in dogs with osteoarthritis. DA: How is it administered and how often does LTCI need to be taken? TB: For canine osteoarthritis treatment, LTCI is administered by a veterinarian with a very simple injection under the dog’s skin. In the first two weeks, it is administered by a 3-1 ml dose, and a 2-1 ml dose in the third and fourth weeks. Maintenance dose schedule will be determined by both the veterinarian and pet owner, based on the dog’s mobility. DA: How soon can pet parents see results in their dogs? TB: Our studies have shown that most dogs start responding to the treatment after the first couple of injections. Of course, each dog’s results will vary depending on their condition and immune status. DA: I’m sure you have heard from many pet parents and veterinarians regarding the effectiveness of LTCI. Can you give us some real world examples or stories of how it has helped canine patients? TB: We have many stories from both vets and pet owners about how LTCI has been a revolutionary, life-saving product for their family. One 17-pound miniature dachshund named Harley has been using LTCI for the past three months, and his owner, Roger has let us know of some amazing results. Just prior to treatment, Roger had resigned to the fact that they were going to have to put Harley down. He was completely immobile and in constant pain. Roger reached out to us to inquire about the LTCI treatment, and since starting Harley’s treatment, they can’t slow him down. He has been running around, jumping on everything and even playing with their kitten. My own dog is also another great example, as he was one of the first LTCI patients. It’s remarkable to see the real-life results of our efforts, and it completely validates what we do. DA: Is this treatment something that a dog must stay on for the rest of their lives in order to fully realize the benefits? And as time goes on, must they increase the dosage in order to benefit from it? TB: Long term studies have not been performed at this point. The next study will observe dogs for an extended period of time. However, the feedback from the field indicates that maintenance doses can be progressively stretched out to 2, 3, and 4 months. My Rottweiler is now on a 4 month dose schedule. DA: LTCI treatments can only be given by a Veterinarian. If one’s veterinarian doesn’t offer it, what do you recommend that they do? TB: Pet owners can access a veterinarian order form here. Once you print it out and provide it to your local vet, they can easily fill it out and order the dosage that’s right for you and your dog. Also, if you’re interested in seeing what other veterinary practices in your area offer LTCI as a treatment option, you can use our Find a Vet tool. DA: Does LTCI help with dogs suffering from IVDD? TB: LTCI’s use would be off-label in the case of IVDD, but if there’s an arthritic component to the disease, then it could be effective in its treatment. DA: Nutraceuticals have become the go to alternative for many pet parents to treat arthritis, such as glucosamine, fish oil and curcumin. Is it safe to take these supplements along with LTCI? If it is safe, would you say there are positive synergistic qualities at play that could potentially aid in the treatment of canine arthritis? TB: Yes, I think the supplements that can provide the building blocks that promote healing might be synergistic with LTCI, since it appears that when the immune mediated process damaging the joint is slowed or arrested, the joint can heal, even in older dogs. DA: What is the future of T-cyte Therapeutics, Inc? Are there more studies going on with LTCI or are there other products in the pipeline. TB: There is an ongoing study being conducted by a very experienced veterinary oncologist using LTCI to treat cancer in dogs. Preliminary results suggest success in a few cancer types, but the results thus far are not definitive. In addition, T-Cyte is considering licensing a cytokine from another company, which shows promise in treating cancer in dogs. The initial data has been submitted for review. Thank you again Dr. Beardsley, this interview was a true privilege and extremely informative. Also, congratulations again on the success of LTCI. We wish you continued success and look forward to speaking again with you in the future. 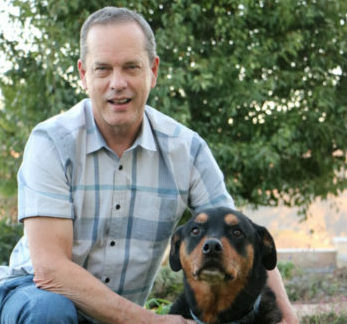 I thoroughly enjoyed my interview with Dr. Beardsley and encourage anyone and everyone who has a dog that suffers from canine osteoarthritis to check out the T-Cyte Therapeutics website, and to ask your veterinarian about LTCI. Your fur baby will thank you for it. How are the trials going for canines with cancer and TCyte? That’s a good question. I haven’t checked back in with Dr. Beardsley. I’ll try to do a follow up and see where they are at.